Getsu Fūma Den (月風魔伝?, lit. "Legend of Getsu Fūma" or "The Legend of the Lunar Wind Demon") is an action role-playing game for the Nintendo Entertainment System by Konami, released in 1987. 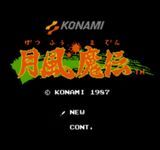 This game was never released outside of Japan, although console emulation hobbyists have translated the game into English. In the first year of the Demon Age（1467), a horrible demon named Dragon Master was revived by his minions in hell. To protect the peace of the overworld, the two eldest Fūma brothers fought the Dragon Master. Both were unable to defeat him and were killed, losing their legendary Hadouken ("wave") swords. To avenge their deaths, the last of the Fūma brothers vowed to slay the Dragon Master and retrieve the swords. The lead character, Getsu Fūma, is based on the real-life 16th century ninja Fūma Kotarō. Source: Wikipedia, "Getsu Fūma Den", available under the CC-BY-SA License.